Food Fanatics is a delicatessen and coffee shop located in the heart of Winchcombe, Gloucestershire and has been providing high quality food and drink with excellent service to our Customers for over 9 years. Our award winning delicatessen has an extensive range of chesses and other delicatessen fare including pies, scotch eggs, olives, pates and fresh pasta. We also sell smoked fish, sausages and bacon, cold meats and fresh soups. Also our freezers are stocked with quality ice creams, sorbets, desserts, pastry, fish cakes and hand made frozen meals. 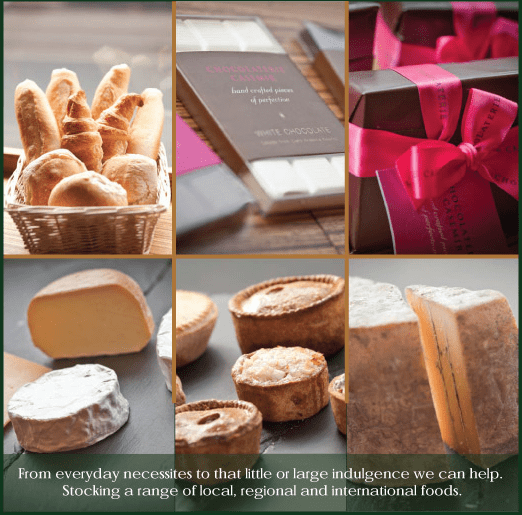 The delicatessen has excellent cooking ingredients, food related gifts and ready made hampers, and offers a range of gluten free food products. The delicatessen also sells a select range of beers, wines and spirits, including a number of beers and spirits from local producers. To complement our delicatessen, our coffee shop provides a relaxing atmosphere in which to enjoy a wide range of hot and cold food and drinks, including Fairtrade coffee, filled sandwiches made to order, hot soups, bacon rolls and a wide selection of cakes. For those who need to keep up to date, the coffee shop has free WiFi. To ensure Food Fanatics can be enjoyed by all Customers, our premises are provided with disabled access and have a suitably equipped customer toilet. In addition to the delicatessen and coffee shop, Food Fanatics also creates bespoke hampers and can also prepares a range of buffet lunches which can be delivered to your home, school or office in the local area.